← Welcome to the 10 Years + Counting Blog! 10 Years + Counting is proud to be collaborating with Split This Rock to present a series of featured contemporary poems that speak to the culture, crisis, and conscience of war. Split This Rock, based in Washington D.C., is a national network of socially engaged poets. Through events including a biannual festival – the third to be held March 22-25, 2012 – Split This Rock works to explore and debate the public role of the poet and the poem in this time of crisis. 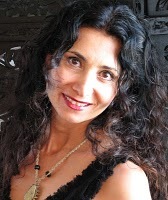 Sholeh Wolpé is the author of Rooftops of Tehran, The Scar Saloon, and Sin: Selected Poems of Forugh Farrokhzad for which she was awarded the Lois Roth Translation Prize in 2010. She is the associate editor of Tablet & Pen: Literary Landscapes from the Modern Middle East (Norton), the guest editor of Atlanta Review (2010 Iran issue) and the poetry editor of the Levantine Review, an online journal about the Middle East. Sholeh is also the editor of Forbidden: Poems from Iran and its Exiles (MSU, 2012). Born in Iran, she presently lives in Los Angeles. This entry was posted in Uncategorized and tagged Poetry, Split This Rock. Bookmark the permalink.